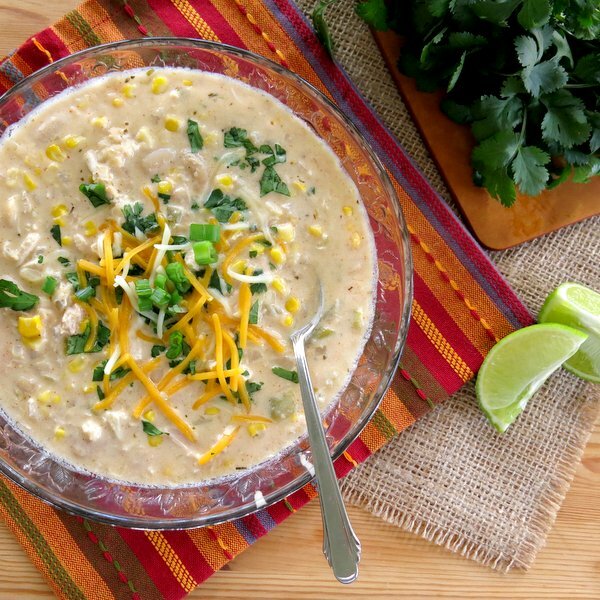 Creamy White Bean Chicken Chili is the perfect blend of cheesy, sweet and spicy. Transform last night’s leftover chicken into a delicious bowl of comfort in under 30 minutes! But, how about coriander? Have you tried it? Is it one of those spices you tried once in a recipe and now don’t know what to do with it? If you like cilantro, then this is your spice. It’s the dried seeds from the cilantro plant and it offers many health benefits, including anti-inflammatory, cholesterol-lowering and blood-sugar lowering properties according to Dr. Weil in Cooking with Spices: Cilantro. But, I just love the taste of coriander (and cilantro as you might have guessed!) 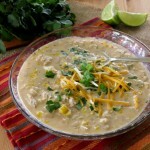 It has a fresh, citrus-like scent and gives creamy white bean chicken chili a distinctive flavor. The cheesiness comes from 1/3 less fat cream cheese and corn adds little punches of sweetness. It’s a delish cheesy, spicy and sweet bowl of comfort! 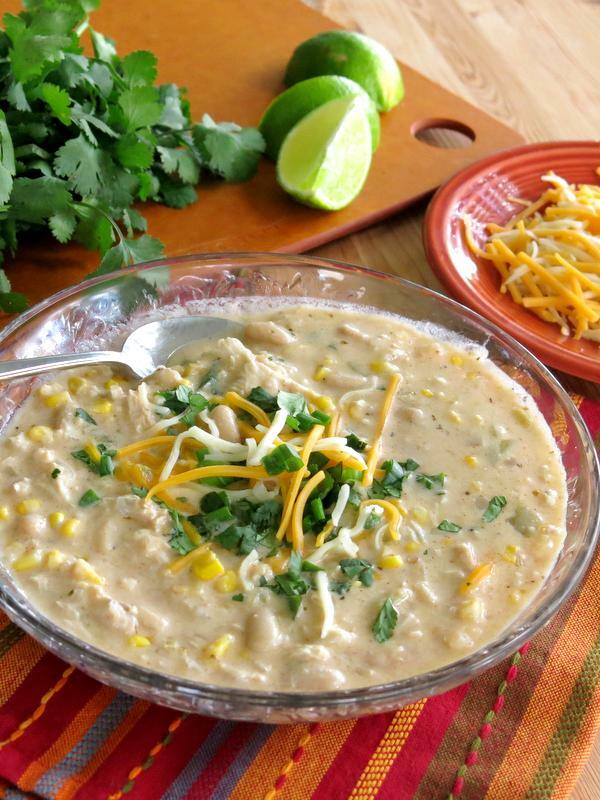 This creamy White Bean Chicken Chili recipe is the perfect blend of cheesy, sweet and spicy. Shred leftover chicken for a quick bowl of comfort. Shred or cut chicken into bite-sized pieces and set aside. Place half the beans, chunks of cream cheese and 1/4 cup of chicken broth in a food processor and pulse until smooth. Set aside. Add onions and saute for about 5 minutes or until softened. Add remaining chicken broth, remaining unprocessed beans, chicken, chilies and the next 7 ingredients to the pot. Bring mixture to a boil and then reduce heat to low and simmer for about 10 minutes. Add pureed bean and cream cheese mixture to pot, stir to combine and simmer for about 10 minutes more. Top with cheese, cilantro and green onions before serving. Leave out corn and use low-fat cheese (less than 6 grams fat per ounce of cheese) to keep recipe South Beach Diet Phase 1 compliant. This looks like the perfect bowl of comfort – so cozy! I am a fan of coriander (I’ve got a huge bottle of it in my pantry that needs to be dug into). I love all the spices! I love making chicken chili. So delicious. Yours looks great!! Creamy flavorful soups are so perfect right now! I need some considering this horrible cold, windy, rainy weather today! This looks right up my alley! 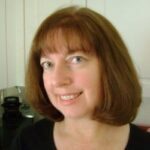 I’m wondering about replacing goat cheese for the cream cheese…any thoughts on balancing flavors? I love the tang with the spice! Looks so creamy and delicious…thanks for sharing! Thanks for your comment. Goat cheese would be great! You might want to just replace the Colby Jack with the goat cheese. Love it! Looks hearty and comforting! I’m a huge chili fan and your version sounds amazing! I love a recipe where I can repurpose leftover chicken. This looks tasty! I really want this chili!!!!! As soon as I saw this on Instagram I knew I needed this recipe ASAP. Pinning! Cream cheese in chili?!?!?! That’s a new one to me! This looks and sounds fantastic! I love coriander, and am slightly addicted to the ground roasted variety…I’m forever running out. This soup is totally happening, and soon! Wow – this looks so so creamy! 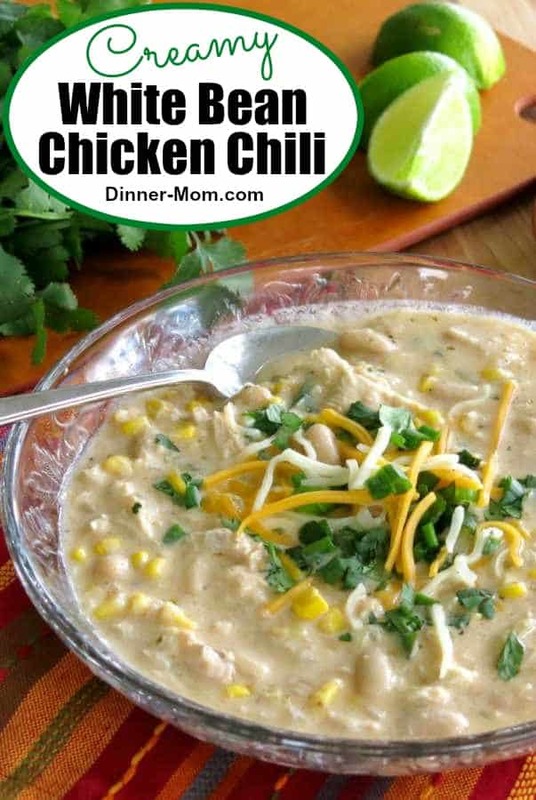 I’ve never tried a white chili before – and I sure would love to dive into this! Coriander works where lemon makes a dish brighter like your chili! Yum! Mmm…never made chili with white beans before but this looks amazing! There is nothing quite like a comforting bowl of chili. It’s why I love Fall so much, just because of the chili. It has been so cold here lately that chili seems like the only thing would warm me up! This looks great! What a great and comforting family dinner!